There are times in life things go wrong. There are times in life we have to communicate to our colleagues or clients that they are wrong. How this is communicated can build or break relationships. 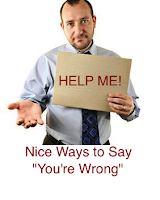 How can we politely tell someone that they are wrong? Let's take a sample sentence and build from this. "I see that there is some problem with the final product. Let's sit and discuss some solutions." "There are a few sections of the report that need to be changed; they are.....(add in details)." "This needs to be looked at again. Something is missing. Shall we discuss it later?" "The code is not stable yet. Let's discuss possible solutions in the team meeting to avoid future bugs." "This design is not user friendly. We have to go back to the client and ask who the end user is and adjust the design accordingly." "The system crashed after that last update. It needs to be reviewed and updated." Do not use you, especially if you is the main subject. - When you is the main subject or overused it gives a harsh and demanding tone to the message. The listener is more likely to react defensively. Describe the mistake, the reason it is a mistake and the possible follow up. Example: Statement of behavior. How it impacts work. Question for problem solving. Statement: The team is a bit worried as you have been late to three meetings this week. Because you were a key player in these meetings, it looks disorganized to the client to be late so many times in one week. Is there anything the team or I can do to help you? Instead of: You have been late three times this week. What's wrong with you? Example: I statement of behavior. Mention of policy or reasoning for brining up this point that relates to work or policy, not personal traits. Question to discuss. Statement: I noticed the data in the reports was displayed using bar charts. We normally use bar charts. How do bar charts enhance this presentation? Instead of: Why did you use bar charts? We can notice that in using these formulas many more words are needed to say the same thing. However, what are the tone differences you can notice from the nice way of posing these types of feedback? If you were receiving this feedback from your colleagues or boss, which feedback method do you prefer? Why? How hard or easy would it be to give feedback using this method? The next time you have to communicate a delicate message, try this technique. Share with us in the comments below how it went. Authentic Journeys provides tailor-made solutions to help your teams with conflict management, constructive criticism and cross-cultural virtual team building. Contact us to learn more. "Jennifer helped me to understand the importance of pleasantries in email writing and avoiding usage of “you” language. After implementing the strategies and making them a habit while email drafting the emails, the clients were more interactive and they greeted me as well in return. In this way, it has helped me in building a healthy client relationship as our work is mainly client facing hence the long term relationship really counts in this matter." Jennifer was assigned to coach Vaishali through Contentment India, Bangalore, India. How do I find a good solution to my problem?